I will take your dog or pack of dogs for a walk in your neighborhood or park. This service is for those of you that have schedules that do not permit you to exercise your dog regularly. This is also a good program for dogs who have "bad" leash manners despite the fact that you walk them everyday. If you would like to be able to walk your dog or pack of dogs in a controlled manner, I am here to help! No dog is too big or too small. 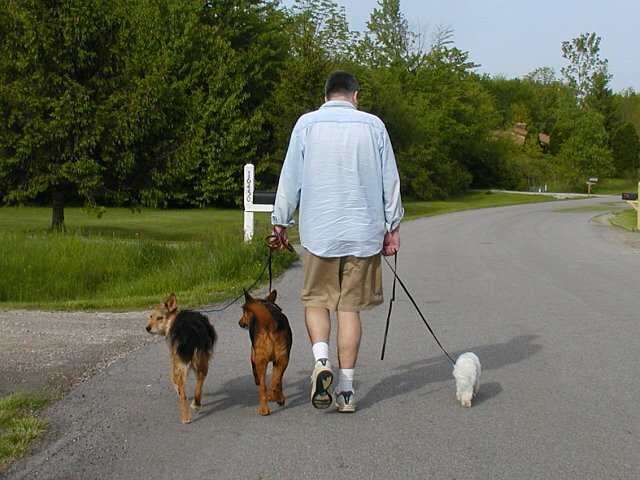 Rates are determined by the number of dogs walked and duration of the walk. Walks are an important, primal canine activity that can help dramatically in removing problem behaviors and draining excess energy in hyperactive dogs. A structured walk is the primary means for creating the strong bond between human and dog that is needed to develop trust and respect. Walks are what dogs crave the most! The key is to have a structured walk where you are the leader and your dog is the follower. If you have a dog that gets overexcited or acts aggressively towards other dogs, resulting in you not taking your walks, consider calling me for help. Please contact me for further details and rates.